Bearing very little relation to the 1937 Paramount musical of the same name, Artists and Models is a lavish, girl-filled vehicle for the popular team of Dean Martin and Jerry Lewis. Martin plays Rick Todd, a comic-book artist who is under fire from his publisher (Eddie Mayehoff), who complains that Rick's work isn't gory enough. Lewis plays Eugene Fullstack, Rick's roommate, who while asleep dreams up elaborate comic-book plots and garishly costumed superheroes. 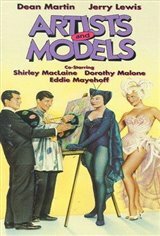 Eugene's nightmares help Rick become a success; meanwhile, our two heroes romance their luscious neighbors, artist Dorothy Malone and rambunctious model Shirley MacLaine (who during one song wrestles Eugene to the floor and sits on his chest!) Eugene's overworked imagination somehow attracts the attention of a group of Russian spies, who attempt to abduct Eugene during the annual Artists and Models Ball. Director Frank Tashlin uses Artists and Models as an excuse for some of the wildest sight-gags seen in a mid-1950s film. At one point, the director contrives to stuff a gag in Shirley MacLaine's mouth. Tashlin also exhibits his ongoing fascination with female breasts and legs by giving ample screen time to the natural attributes of co-stars Anita Ekberg and Eva Gabor. One of the best of the Martin/Lewis efforts, Artists and Models suffers only from being about 20 minutes too long.